Think of a large office building that was constructed in the 1950s. It was built with the best technical and artistic understanding of the time, both to please the eye (possibly) and to be functional (primarily). It’s taking up highly valuable real estate in a location that everyone wants to be and build. It’s kind of an eyesore now, unless you’re exceptionally nostalgic. It’s been maintained fairly well, including some paint, new windows, a fresh roof, and so on. But all around it in that costly area we see that newer, better buildings have sprung up. They are feats of engineering, testaments to materials science, and visions of artistic grandeur. They are massive edifices that reach high upwards, dwarfing the quaint neighbour from a time that is dimly, though fondly, remembered. We can continue to give that tiny building a face-lift, replacing the carpet or changing the fixtures. Or we can rebuild, keeping the parts that make it a functional building while applying our new understanding and skills to an improved design. That new building will look and feel dramatically different. There will be more space, more options, more possibilities for its use. It will still be a building, and it will still have the same basic purpose, but it won’t be a barrier to progress the way the aging structure is. Most importantly, perhaps, are the windows: the new building will be much more transparent. We currently have that old building in Ontario. Let’s stop replacing broken tiles and repainting the paneling, and let’s talk about how to rebuild. Take a look at the first point in “Use of planning skills”, called “understanding the problem”, which includes “formulating and interpreting the problem” as an example of that skill. 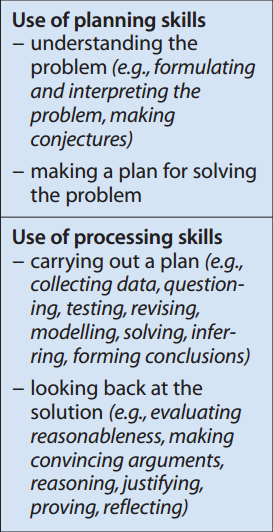 Now look at “Use of processing skills” point “carrying out a plan”, which includes “modelling” as an example of that skill. Are these different? 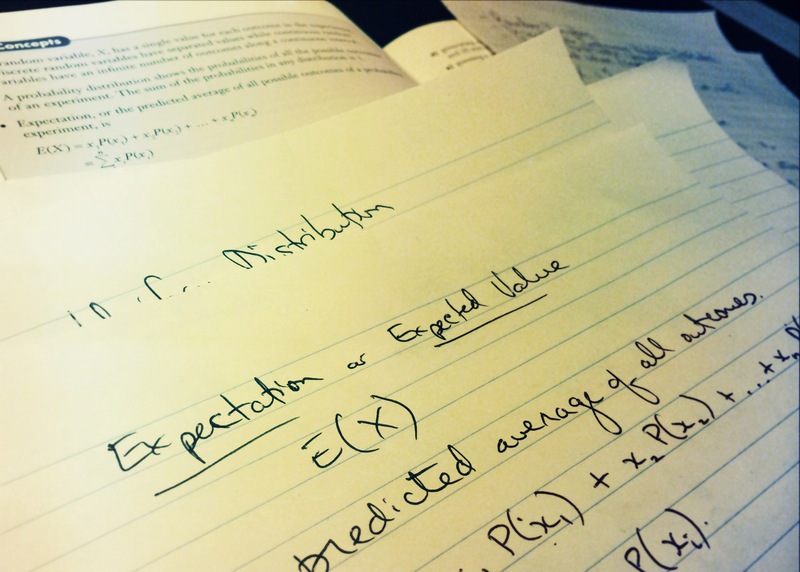 In my mind (up until now, at least), “formulating and interpreting the problem” has meant representing a situation mathematically so that we can apply our other math skills to solving it. Isn’t “modelling” in the context of “carrying out the plan” sort of the same thing? Representing components of the problem mathematically? Is the difference just when it happens (i.e. formulating/interpreting is initial planning, and modelling is during the act of solving)? I’m not trying to be pedantic here; I’m having trouble distinguishing between the different components of Thinking when I’m trying to assess and evaluate my students’ work. I could use some external thinking on this issue (and math evaluation in general, I suppose). Please comment; I’d love to talk to you if you have ideas about this stuff. I am trying to develop a task for my online ICS3C/3U Computer Programming/Science class, and I need the students to be deeply “engaged”. I return again to my latest, favouritest definition for student engagement: “A student is engaged in learning when they feel a compulsion to pursue the learning apart from external motivations.” That is, not just for marks, and not just because Mr. G said they have to. I want them to want to learn. So I want the students to pursue their own interests as much as possible. I believe giving students the freedom to choose will be a lot more likely to kindle that compulsion I want to see in them, and will result in deeper learning and, rather importantly, more fun for all of us. enough restrictions to ensure that they are learning for this course (since I have to assess and evaluate them). So I’m a little stuck. I’ve created an openly-editable Google Doc with their learning goals and my initial thoughts. I would be very, very pleased if you would take a look and add comments, ideas, criticisms… anything that can help me move forward with this. I’m trying to plan very carefully to minimize the chance that this wastes my students’ time and effort, and to minimize any unnecessary frustrations they experience. Much thanks in advance, from me and from my students! If-Then: are we thinking about it backwards? At first I thought, No, that’s the same thing written the opposite way. Then I realized it’s not the same. I had just finished a conversation with another teacher about how we can’t change one facet of our practice and honestly expect a dramatic improvement in student engagement. There are too many separate problems which are contributing to the common symptom of disengagement; removing any one of those problems can’t be enough (although it can help). So Tarmo’s thinking is really important here. Instead of fooling ourselves into believing that a single change can correct this issue, we should perhaps try to grasp the larger picture. We look instead to the end goal and determine what conditions need to be in place and what actions we need to take to achieve that goal. To be clear: the If-Then structure is still valuable for a single action or group of similar actions, but it won’t be enough to describe solutions to a multi-faceted, complex problem. Unless your “If” has a lot of “ands”. Today I worked with all of the other e-Learning teachers in my board. We had some excellent discussions which tended to drift back to the idea of student engagement. I don’t really like the term “engagement”; I don’t think it’s clear enough. People have very different understandings of the word in the context of student learning, and that can get in the way of real improvement. For example, asking “what does student engagement look like?” yields responses like “they’re paying attention” or “they complete the assigned work” alongside “they are applying their learning to their own lives” and “they connect to outside sources for learning”. Some of these are more accurate or useful than others, but they are all indications of student engagement, I guess. But for me, student engagement is a question of student intent in their learning, which isn’t exactly an observable behaviour. That last bit is key for me: why is the student learning? Because they need the marks? Because they fear consequences? Because they are enthralled by a question? Because they are curious? So this leads me to the question: why are my students disengaged? The question holds as much value regarding e-Learning students as face-to-face students. My colleagues and I identified approximately a bazillion potential causes of and contributing factors to disengagement. These are approaches or circumstances which prevent students from developing the compulsion to learn. Some of them we can work to improve; others we can’t. But in the end I keep coming back to this idea: Good questions produce a compulsion to find answers, and the best questions are students’ own questions. Look at me: I just spent an entire day grappling with questions alongside my peers, and here I am trying to make more sense of it at night. I have a dozen other tasks to complete before I can sleep, but I need to get this out right now so that I can pursue the answers. I am compelled. So how do we foster a spirit of questioning and a culture of inquiry in the context of prescribed learning? That’s my own challenge to work on tomorrow: how will I ensure that I’m giving students both the guidance and the latitude they need to pose great questions and then pursue the answers? I’m thinking about trying to tap into the students’ interests in my online computer science course. We’re at the point now where the [up-to-date] students have enough of the basics to be able to pursue topics of their choosing. I was considering making a discussion forum/topic where they can share ideas they’re interested in, and then encouraging them to pursue that learning. I’m not sure how to word it, or manage it, or what exactly I hope to get from it, except that it’s important for students to take charge of their own learning. Maybe several students will have similar interests and be able to pursue them together. I reminded my MDM4U students to visit our class blog today as I had posted a video this morning with solutions to some questions from class. I was pleased to hear that a few students have been heading there regularly. I played a bit of the video on the screen so they would understand what it was like, and then I asked for input about the sorts of resources they would like me to post. First, most students want to have the videos. They’re nothing magical; they’re just me solving some problems on paper. A couple of students said they like the idea of being able to rewind me (since that’s hard to do live, in class). Second, a few students also want a text format of some kind (a blog post, a PDF file, or something like that). I understand that; it’s faster if you just need a short bit of explanation. It takes a lot longer to type out a solution, but I could always write one and take a photo, I suppose. The third response I took away was that posting videos like this is unusual in their experience, and they appreciate the extra effort on my part. Several students seemed to understand how much extra work goes into creating these supplementary resources, so that was nice. I care a lot about their success, and I’m hoping to give my students a better-than-average chance at being great at this stuff. A lot of the responsibility lies with them, but I’ll remove as many barriers to their learning as I can. I’m glad to hear that my work on the blog is being well-received.